When did you find your Passion, or when did it find you? Casey is a DCH 5 Star Mentor, birth and postpartum doula who has worked with families for 11 years, and has been with Doulas of Capitol Hill since 2016. Working with women and families has been something I have loved ever since I can remember. My mom always tells the story of her knowing that this type of work was where I was going to end up because in fourth grade, I was the only child she knew excited to rush off the bus at 4pm to be home in time for A Baby Story on TLC. I continued to love being around babies and babysat and nannied through my undergraduate degree in chemistry and my MPH with a focus on women’s health. I learned was a doula was in college, interned at a natural birth center and was hooked from there! I am always seeking to be better and know more and am proud that I am someone who works hard to get to where I want to be. I don’t let things get me down for too long. If something doesn’t go to plan, I roll with it, work to understand why and equip myself to change it for the next time. An example of this, in the spirit of International Cesarean Awareness month, is my birth experience with my son. Unexpectedly, I found myself needing a c-section and although I know that it was the best decision for both of us at the time, I still had to mourn the birth that I had always planned. I am now preparing for a VBAC with my second baby next month but have made a plan with my provider that I feel great about, even if this baby also needs to be born by csection. If a kid walked up to you asking for your advice and you only had a few minutes to give ‘em your best tip, what would it be? That everything life is temporary. If you are feeling bad about yourself in a certain area? Change it! Don’t like how you look? Change it! Feeling doubt? Prove it wrong! You have the ability and the power to constantly invent and re-invent yourself – you are only done growing and changing when YOU decide that you are. I have always, always wanted to be a mom and a wife, I get to do both of these things every day and although it’s not always easy, it is rarely, if ever boring! I am incredibly lucky that I am able to do what I love and come home to my best boys at the end of the day. Somewhat related to the passion question – I grew up wanting to be an OBGYN! How do you like to be told you’re doing a good job? I am a big written words person, I keep cards that people have written me for YEARS, much to my husband’s dismay, literally though I have a box of cards and notes from high school. Another fun fact, I never delete my text messages either. I like to know that I’ve helped make the lives of those around me a little easier and knowing that something really small made me come to mind. I also love hearing updates from families I’ve worked with, too! I actually can’t believe that my very first birth doula client is about to have a seven year old! To freeze time, hands down! I would take so many naps, get so much stuff done and DEFINITELY play some pranks on my husband while he was frozen. How would you describe your (doula) style? My style as a doula is pretty true to my style as a person – laid back, go with the flow, some humor sprinkled in there to lighten the mood and full of fun facts! One of the things that I value most is relationships, so I will strive to connect with the families I am working alongside, I feel like it makes everything easier, more comfortable and much more fun! Loyal, supportive, adventurous (but not so much with food), compassionate, encouraging. Doulas of Capitol Hill is happy to have several postpartum doulas on our team who can teach parents infant massage. In this video below we learn tips from Casey Nelson, birth and postpartum doula. Also on the DCH team is Kim Stinger, Licensed Massage Therapist and postpartum doula, who provides our in-home prenatal, induction, and postnatal massage, as well as infant massage education to her postpartum doula clients. As an expert on massage, Kim is able to share the benefits, as well as teach techniques to new parents, grandparents, and family members. Kim says, “infant massage can be used as a tool to bond with baby, reduce crying, and to help your baby relax and sleep. It can be a great tool to use when establishing bedtime routines.” To schedule an in-home postpartum support session and learn these techniques from Kim please contact us today! Doulas of Capitol Hill has experienced postpartum doulas and licensed massage therapists who can teach baby massage techniques to new parents in the comfort of their own home. Contact us today to schedule a session! The creation of this resources guide was a collaborative project by some of the black women who work with Doulas of Capitol Hill and our sister company Doulas of Prince George’s County. Spear-heading the project was Charissa Young, birth and postpartum doula, prenatal yoga instructor, and owner of Luxe Mamma, a company which creates luxury gift boxes for new moms as well as services for pregnant moms. Additional resource collaboration came from Jade Hillery, birth doula with Doulas of Capitol Hill and reproductive health champion. Jade has her Masters in Public Health in Health Education and Promotion. It was important to all of us at DCH and DPG that this guide be created for black women and by black women and have only auxiliary support by those who are not black women . We did try to include as many resources of businesses owned by women /people of color in the DMV or for those national organizations or resources whose purpose is explicitly to further the health, well-being, and support of black women. Thank you to both Charissa and Jade and all the providers on this list! The guide is by no means exhaustive, and we are sure to have missed some fantastic resources and providers. If you have a provider you think we should know about please send us an email or message us on Facebook or Instagram. Additionally, if there is a category you think we omitted, please let us know! This is YOUR story. Hospitals more likely to formula feed children of black mothers, study says. PG County Breastfeeding Coalition, coming soon! Kim Stinger- Doulas of Capitol Hill, Licensed Massage Therapist providing prenatal, postpartum, and induction massage. Today we’d like to share our top water-related tips for pregnancy, birth, and breastfeeding. For every share on Facebook or Instagram of our blog we’ll donate $1 to Water for People. The World Health Organization estimates that for every $1 spent on water, sanitation and hygiene programs, there is about a $4 return in productivity. Water is life and that is true even more true during pregnancy when access to clean water means a healthier pregnancy. Access during labor means an environment with less risk for easily avoidable infections (hello, hand washing!) and preventable deaths. Availability of clean drinking water for new mothers and babies means healthier families who grow and thrive. This article in the Huffington Post explains many of the direct and indirect consequences to lack of clean water to women and girls and how that relates to maternal health. Thankfully, our clients in DC, Northern Virginia, and Maryland who are hiring a doula, overnight newborn care, or breastfeeding specialist aren’t likely to be personally impacted by lack of clean water access in their homes, birth center, or the hospital where they deliver. So today we’re giving our 4 Doula Tips about water for pregnancy, birth, and postpartum! You’re up at night Googling “What does a contraction feel like?” and you’re not sure if it’s time to call your doula. You remember she insisted you CALL (not text or email) if ANYTHING was potentially happening, so you call. She listens intently to what you’re feeling, and agrees, it could be labor, or it could be Braxton-Hicks, aka “practice contractions.” She suggests trying these three steps and to call her back, reassuring her that “real labor” contractions will get longer, stronger, and closer together. If this doesn’t happen after trying these three steps, it’s probably safe to say your body is just practicing. You’ve seen tv and movies of childbirth. From Katherine Heigl’s screams in Knocked Up to Melissa McCarthy banging on a drum during The Back Up Plan to basically everyone in What to Expect When You’re Expecting, all of them have one thing in common, the women are freaking out. We know, and studies agree, that laboring and pushing in the water has a lot of advantages. That’s why when you search “waterbirth in DC” or “waterbirth in Northern Virginia” you may see our name come up; we rent birth tubs for people to use at home. We also support clients who are delivering at hospitals and birth centers where laboring or delivery in the water is an option. We’re especially looking forward to the return of tubs at George Washington University Hospital! It’s that moment that everyone fears will happen at the worst time, like when you’re in your bosses office! People make jokes about it, too, which makes it even more nerve wracking. One mom told us about her own experience with a person working at Wal-Mart who thought they’d be funny and followed the mom around the store with a mop “just in case” her water broke while she was shopping. She was only 7 months pregnant! Some people just have no idea! “Pumping moms may find that they need to pay more attention to remembering to stay hydrated.” - Kelly Mom.com, Do Breastfeeding Mothers Need Extra Calories or Fluid? By Kelly Bonyata, IBCLC. 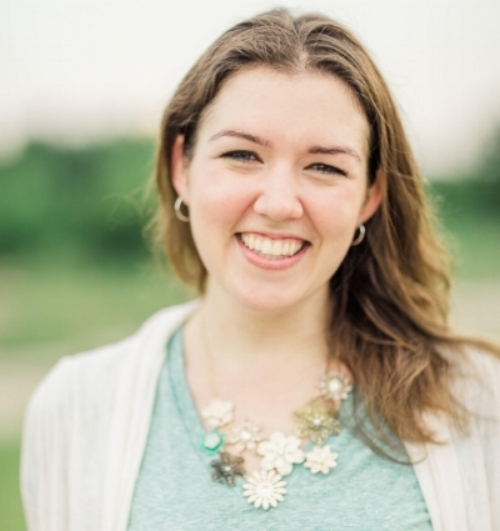 Jenna has been with Doulas of Capitol Hill since 2017 serving families in Northern Virginia and DC with warmth, expertise, and compassion. I started off my career as a Labor and Delivery Nurse 10 years ago. I’ve always loved Women’s Health and after my first experience in a delivery room as a nursing student, I knew it’s what I wanted to do! I worked Labor and Delivery for several years, during which time I had my first child. During this time, I saw how hard breastfeeding could be! I was really lucky to have a great friend who was a great support for me and I realized we needed more people like that! During the next few years, while working at an OB/Gyn office, I obtained my IBCLC. Since then, I’ve been working helping breastfeeding families meet their breastfeeding goals! I truly love my work! Don’t sweat the little stuff! My ability to continue learning and help families! I love my family and my job! My children, Isabelle and Caroline, bring me unsurmountable joy (and sometimes frustration! ), and I feel very fortunate to be their Mom. When I was younger, I wanted to be a nurse, then went to college to become a veterinarian, eventually changing gears and getting my Bachelor’s in Nursing. What are your top three values? Tell me about your favorite book or movie. I just finished listening to Michelle Obama’s book “Becoming” and it was A.M.A.Z.I.N.G! It was inspirational hearing about her background growing up, and her family values and how she became to be who she is today. It’s very inspiring to hear how someone with a background not terribly different from many people, went on to do such amazing and incredible things. My biggest compliment is when a family tells me I helped them reach a breastfeeding goal. These can look different for everyone, but breastfeeding was an experience I truly enjoyed with both of my children, so to help other women meet their own goals is why I do what I do! I try to meet families where they are in both their breastfeeding journey and their short and long term goals. Breastfeeding goals look different for everyone, so I pride myself on coming up with an individualized plan for each family. I recently completed a Master Class training on Oral Habilitation and learned so many new things and new ways to help families. It was so exciting to be able to now have even more tools and strategies to use during consults! 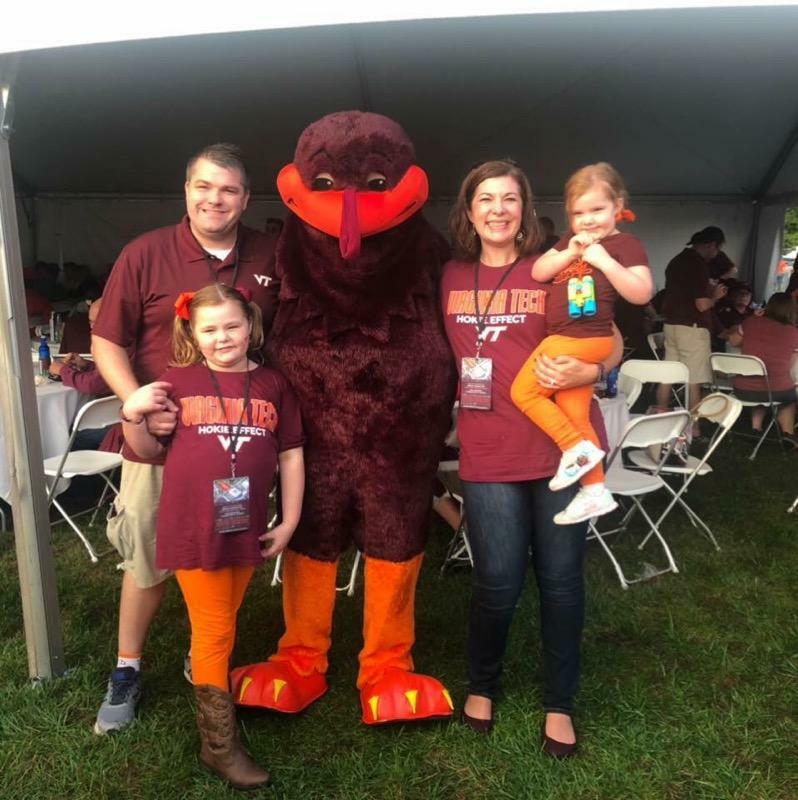 Jenna and her family are life-long Hokie’s! The holidays and weather factor into this, but it’s also flu season and seasonal illnesses are at a high. This is why, if you find yourself healthy in these winter months, donating blood is of utmost importance. Blood transfusion in pregnant and postpartum women is a common occurrence. The two main reasons for blood transfusion are postpartum hemorrhages and severe anemia. According to the National Center for Biotechnology Information, postpartum hemorrhaging is responsible for 25% of material morality. The average amount of blood loss after the birth of a single baby in vaginal delivery is about 500 ml or 1,000 ml in a cesarean delivery. Any loss above this is considered a postpartum hemorrhage with varying levels of severity. Women who loose 1500-2000+ ml of blood have extreme hemorrhaging and need blood transfusions. This means the woman has lost 25-35% of her blood volume. About 5% of women suffer from postpartum hemorrhage and that number is more likely with a cesarean birth which account for over 30% of births in the US. According to the National Center for Biotechnology Information, anemia during pregnancy is responsible for 15% of maternal mortality. Anemia during pregnancy is quite common and can usually be treated with extra iron supplements or change in diet. However if anemia isn’t addressed during pregnancy it can become severe causing loss of blood or preventions of clotting during labor or postpartum and may require a blood transfusion. According to The American Red Cross, one person can donate around 470ml of blood at a time. This means, often, and in severe cases, one person may need blood donated from several people to save their lives. We’ve compiled a list of places local to the DMV to donate. If you know of others please drop us a comment or an email! INOVA Blood Donor Services- Locations in Alexandria, Annandale, Centerville, and Sterling. National Institute of Health- Bethesda. Kaely Harrod is a birth doula with Doulas of Capitol Hill and our sister company, Doulas of Prince George’s County since 2018. She is also an accredited La Leche League Leader since 2014. When did you find your Passion, or when did it find you?. I found my passion for helping women as a college student. I now support all birthing people in an non-judgemental way, but my passion was birthed from an inherent desire to help women specifically. I often dreamed of how to meet needs that were gaps in women’s lives, whether that was encouragement, health and nutrition, housing, abuse healing, and trauma care, etc. Out of that desire, I began assisting friends in various ways as there was the need. It didn’t birth anything organized until I decided to become an accredited La Leche League Leader in 2014. After entering the world of postpartum care I found that this specific season of pregnancy, birth and postpartum care was a specific passion that fit perfectly within my passion to help and encourage women. I find great fulfillment from offering support and encouragement to people in this phase of their lives. It is a beautiful thing to be allowed into this deeply personal and vulnerable time and given a space to participate, strengthen and advocate. Be kind to everyone! No matter who they are! Even if they are not kind to you. Kindness is always worthwhile and needed more than ever. Someone else’s meanness does not need to dictate your level of kindness. I am proud of my faithfulness and loyalty to other people and myself. I am true to who I am and consistent in what I can give in my relationships. If I’m your friend, I’m your friend and I’ll be loyal and faithful in that relationship. It’s something that’s easier for me to give to others than it is to give to myself, so I’m a work in progress on that front. But I am getting a lot better at giving myself loyal love in my desires and passions and preferences without judgment or shame. That means a lot to me, so it’s something I’m very proud of in myself. I love that I have a loving husband who is my biggest fan ever and best friend. He supports me in all my dreams and passions and sees things in me that I can’t see in myself. He’s also just loads of fun and my favorite person to talk to! I also love that we have 3 fun kiddos that are a part of our mix. I wanted to be a ballerina or a firefighter! :) As a child, I remember my mom telling me that I could probably do both of those as neither requires typical 9-5 hours! “Favorites” are a thing that changes for me kind of often, so right now I’m loving The Great British Baking Show. I have also gotten my children and husband into it, which is super fun. I also really enjoy watching Master Chef Jr! Those kids are hilarious! I like to be told specifics about what was/is good. So let’s say I’m teaching my children (I’m a homeschooler as well as a doula! ), and someone wants to tell me I’m doing it well. I would prefer to be told something like “I see your child(ren) acting empathetically toward others and I know that is a result of your teaching! Keep doing that! It’s slow going, but it’s taking hold!” Rather than just saying “your kids are so smart!” Or something more generic like that. My role model is my mother. She has faced many struggles and is persistent and strong in the midst of and in spite of them. I have seen her grow and develop as a mother over the years and that has been a learning opportunity for me, too. She’s a consistent support to us all as adults now while still doing what she loves! She is also my biggest encourager in homeschooling outside of my husband. If I’m ever doubting my work with my children I can call her up for a quick pep talk that changes everything. Since we share that passion for encouraging others she is a role model for me in that as well! I would describe my doula style as relaxed, supportive and taking my cues from my clients. I tend to want to learn a lot about who my clients are and how they operate in order to meet them in that space and not try to force them into my world of operation. I have the knowledge base to support and comfort in a variety of ways, but I want to match those comfort measures with who my client is and what they value in the birth! Fun, Honest, Loyal, Loving, and Encouraging. Kaely, bottom right, with all of her siblings! The holiday season is filled with so much joy and celebration. But we know that it can also bring on a lot of stress and heavy comfort foods. For the months of November and December Doulas of Capitol Hill is celebrating how to have a healthy holiday season. One of the ways we want to encourage you to participate in the holidays, while minding your health, is by providing some easy and delicious recipes. Chef and postpartum doula, Vanessa Fowler, is sharing a warm and colorful root vegetable based dish with us that is a perfect mix between comforting and healthy! Winter is here and staying active & healthy is still very important. As a chef and doula I work with clients to maintain a balance of staying healthy for themselves, their newborns, and the new changes coming. Along with maintaining my own self health. I try to cook seasonally. Winter brings us citrus and root veggies and abutment use of the stove so roasting and braising gets us into the kitchen, warms up the home, and feeds us well. This is taken seasonal winter veg and roasting it, then topping it with that great sweet and sour sauce known as Agrodolce (agro-(sour) dolce-(sweet)), this sauce is commonly found in either your Chinese/Asian food or Italian. As a chef I get asked the question “what kind of food do you cook”? Well I am French trained so I always have French foundations but I cook comfort foods that fall into the Italian & Asian category. Real Food for Pregnancy should be on every must-read list for all newly pregnant people, or those trying to conceive. The author, Lily Nichols, covers all of the bases on what to eat during pregnancy and what to avoid, taking time to explain the nutritional evidence for and against specific foods. More than that, Real Food for Pregnancy goes beyond food and tackles exercise, common pregnancy complaints and conditions, how to avoid toxins in our modern world, and even after baby is born and into the “Fourth Trimester.” The book makes a compelling case for optimizing prenatal health through nutrient-dense foods, through a Paleo-ish diet, providing a refreshing, research-backed approach that is both referenced and an easy read for the expecting person. We all know the old adage of “eating for two” but the author encourages us to “think quality over quantity,” by focusing on macronutrients like protein, healthy fats, and vegetables. I had an Ah-ha moment when I learned that folate, derives from the word “foliage,” meaning that dark leafy greens are a major source of an essential nutrient packed into every prenatal vitamin. However, in prenatal vitamins it’s the synthetic version, folic acid, which can be harder for the body to process, especially the 30% of the population with the MTHFR gene mutation. Deficiencies in folic acid can lead to birth defects and can impair brain development, making it so important for the whole population of pregnant people to get enough folate if their bodies aren’t great at processing the folic acid in their prenatal vitamin. In this book you’ll also get sample meal plans and several recipes! One of my favorites was Lily’s Electrolyte Replenishment Drink, a recipe that is great for the first trimester, when many people experience dreaded “morning sickness” that often lasts all day. This drink is also good for labor, when the body may be taking a break on digestion, but the energy needed for birthing a baby increases. As a birth doula and postpartum doula in the DC metro area, my clients often come to me for advice and resources to guide them to a healthy pregnancy. They tell me their doctors don’t give them much in nutritional guidance other than to avoid alcohol, too much fish with mercury, and to take prenatal vitamins. But pregnant people are some of the most motivated individuals and are willing to learn new tools to lead a healthier lifestyle for themselves and their babies. They want to know how to avoid unnecessary and sometimes scary interventions during labor, and one of the best ways to do that is to stay low risk throughout the pregnancy. If the end goal of pregnancy is a healthy baby and a healthy (and happy) mom, then this book will help get you to that rewarding end! Today Vanessa Fowler, chef and postpartum doula, is sharing a little bit of a treat to kick off our December. What better way to kick off the season then with eggnog and we aren’t just going to drink it but we are going to eat it too! 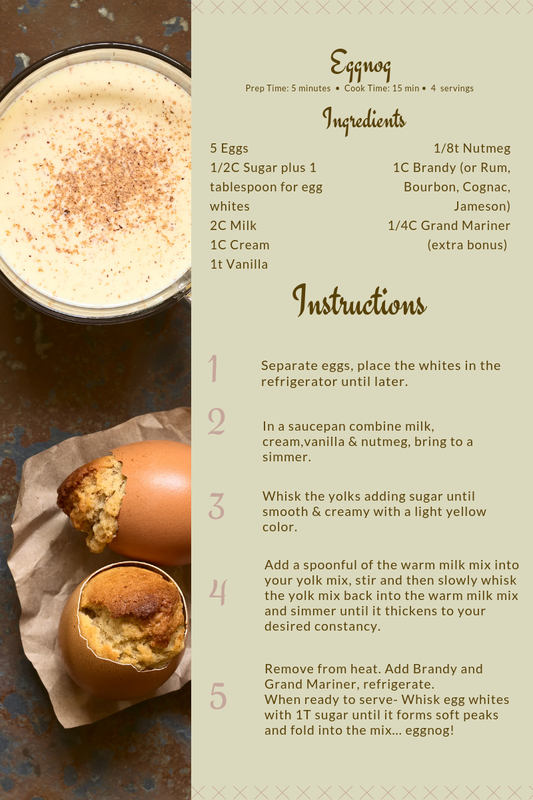 This eggnog recipe is a classic but with a nice warm winter twist (Brandy) plus a tasty bonus (Grand Mariner). My family loves bread and this season is all about baking so I figured why not eggnog bread but without yeast making it quick bread! Both are tasty as is but are very versatile as well! If you choose to skip the Grand Mariner I still want you to add a drop of orange flavor. You can do so by adding one teaspoon of orange zest to the glaze of the bread! As a part of our Healthy for the Holiday series, we’re excited to share this interview with instructor Fran Darnell of Dynamic Mama and Dynamic Core classes at Rooted Pilates on the Hill. Dynamic Mama is an intimate group program that combines Pilates, mindful movement, and coaching to help mamas and mamas-to-be reconnect with their bodies, reclaim their strength, and gracefully move through the miracles of motherhood from prenatal to postpartum. To find out more about upcoming workshops starting in January and April 2019 please check out Dynamic Core for information. What led you to this career? Ever since I was young I have loved movement, and I have found that it is an incredible resource to help me feel uplifted, present in the moment, more centered, connected with myself, and capable of doing things with strength and grace. My mom was an occupational therapist and through witnessing her work I first learned that movement is healing. In college I studied dance and kinesthetic anatomy which lead me to realize that embodiment is healing. Now more than ever we need to become more present in our body, especially in today’s world we are often more up in our heads than we are engaged in our body. Right after graduating college I began my Pilates certification. I was inspired to teach Pilates because I have found it to be a movement practice that supports anyone and every body. From focusing on creating healing and rehabilitation to strengthening and functional fitness, and any combination in between, Pilates helps you develop more strength and resilience. I am passionate about working with mothers through pregnancy, postpartum and beyond as motherhood is a truly transformational experience of body, heart, mind and spirit. Pilates is a powerful practice to help mothers mindfully strengthen their core, pelvic floor, and feel centered and connected to your new sense of self. I offer a holistic approach to wellness that combines Pilates, coaching, and energy healing to help women reclaim and restore the harmony of their dynamic core. What do you enjoy most about work? I really enjoy getting to help women feel more connect to the core of who they are and helping them to feel tapped into the strength and power they hold within their body. At whatever stage of motherhood we work together whether it is pre-conception preparation, prenatal, postpartum, or many years beyond the power of just showing up for yourself and feeling a commitment to your wellbeing is transformational in itself. I love seeing women shift from the inside out becoming more stable & strong as they connect to their core in a whole new level. Especially when working on managing diastasis recti or healing pelvic floor imbalances, it is so exciting when a woman feels a more whole and integrated sense in her core, when she feels aligned, and can sense her muscles responding. I love helping women build upon the strengths they have inside and out and feel even more capable to do all they want to do, and choose how they want to feel as they move through their life. If you are a parent, how was your birth and postpartum? I am not yet a parent, and very much look forward to making my own family. With over a decade of supporting women through pregnancy, birth and beyond I have seen women through so many different birth experiences. I trust my own journey will be a great teacher to me, and that this will deeply inform my work. What resources would you want parents to have? I would want parents to have a resource of breathing exercises to help release anxiety, feel more present and grounded. I also wish that all parents could receive a basic understanding of their anatomy & how the pelvic floor, abdominal muscles, back muscles and your diaphragm function together harmoniously- making up the core of your body. The knowledge of your body is a powerful tool to understand how some simple movements can help you feel stronger, let go of tension, and feel more supported from within. This can help you know how to carry your child accessing the strength within yourself rather than straining your back or overworking in yours shoulders and neck. Numerous times my clients have shared with me how they’ve taught their partner what we’ve been working on so they too can feel stronger and more ease in carrying and caring for their little ones. What is one unique thing about your business that your customers/clients love? My clients really appreciate my gift of active listening which allows me to tune in to the parts of a person where they need to foster and connect their mind with their body so that they can achieve what they are really wanting. They love how I am then able to guide them through a movement practice that helps them feel more strength, alignment, and a clear body memory of what it feels like to be tapped into their whole self. What's one thing you think the world needs to do to improve the lives of new parents (or people living in our service area)? One thing I think that needs to be improved upon in particular in the US is providing more integrated care for new moms. Too often women are feeling isolated and alone, tolerating pain, silently experiencing incontinence, sometimes not even realizing they have pelvic floor imbalances, instability in their core, or diastasis recti. Every new mother should be able to receive a women’s wellness visit with a pelvic floor physical therapist, receive therapy or some sort of emotional support, and feel the presence of community. There is so much connection and checking in preparation to bringing a child into your life. When a woman is expecting a baby there are frequent check-ins, and then after birth there is often only one checkup for the mom. Mothers need more support, and all too often have to advocate for themselves. We really need to expand upon access to maternal care for new moms. What do you think is the hardest part of expecting baby or becoming a parent? One of the hardest parts I see women facing in expecting baby and becoming a parent is letting go of control, or rather accepting that even with the best plans things may happen in a way that you can’t control. This is really true in all of life, it just gets magnified in a big way in the transformation of becoming a parent. This can lead to anxiety, and I find that movement and simply breathing is a powerful tool, to help you get present in the moment, accept what you can’t change, and be guided by your body’s wisdom and intuition to focus on what you can do, and how you can choose to feel as you move through it. What products or services do you personally love? I personally really love using therabands and the foam roller. These are two props that don’t take up a lot of space and are incredible for either stretching and massaging your body, or giving you some extra resistance or challenge to help you strengthen even more. These are the first two props I would suggest any client purchase, and the ones I personally reach for and the Therband is so easy to use on the go! I start each day simply thinking how fortunate I am for waking up and how grateful I am for this day. I then take a moment to think of gratitude for my health, the love I share with my husband, our home, nourishment of food, and love from family & friends, and my gratitude for the work I get to do and all the incredible people I get to work with and support, I give my husband a kiss good morning and depending on my day the rest of my morning routine unfolds. On simple mornings I’ll dry brush, shower, have breakfast, and then off to client sessions. On more spacious mornings I like to choose any combination of what my body is telling me it needs from dancing to a song, journaling & meditating, my Pilates practice & reiki practice, drawing oracle cards, going for a walk outside, or sometimes a morning swim. What's your favorite thing to do in DC? My favorite thing to do in DC is take advantage of all the incredible access to nature and being active outdoors by using the bike share bikes to get around the city, visiting the arboretum to check out all the different groves of trees in bloom throughout the year, paddle boarding on the river, or hiking in any of the parks in the area. The holiday season is filled with so much joy and celebration. But we know that it can also bring on a lot of stress and heavy comfort foods. For the months of November and December Doulas of Capitol Hill is celebrating how to have a healthy holiday season. One of the ways we want to encourage you to participate in the holidays, while minding your health, is by providing some easy and delicious recipes. Our team chef and postpartum doula, Vanessa Fowler, is sharing one of those recipes with you today. Here is another recipe this time though... Thanksgiving! And because it is Thanksgiving, we’ll splurge just a little bit. This is a classic mashed potatoes recipe but instead of adding flavor directly it’s being infused in other ways so you don’t get the herbs throughout your creamy golden potatoes. Yukon golds are a little less starchy than russets and I just favor them. Doulas of Capitol Hill was founded on three guiding principles: Support the Family, Build the Community. Grow the Profession. Today on the blog we are sharing this resource from Dr. Emma Basch PsyD, a psychologist in Washington, DC, who specializes in women’s mental health with a focus on perinatal and reproductive concerns. Dr. Basch was a recent guest speaker to one of our team meetings and she shared her expertise with our birth and postpartum doulas, as well as our lactation consultants, to help our professionals continuing education and growth. She provides this useful guide for doulas to support clients and their families. Recently the American College of Obstetrics and Gynecology (ACOG) updated their recommendations that women see their health care provider sooner than 6 weeks to screen for physical and mental health complications. Having a doula during pregnancy and in the first year after birth is an additional layer of support to see you through this transitional time between leaving the hospital and seeing your health care provider. Dr. Basch acknowledges that “reaching out to a therapist can feel like a daunting task.” She recognizes the valuable role that doulas can play in screening for PMAD’s, as we often spend many hours with a client over weeks or months, whereas a doctor or nurse may only spend a few minutes. PMAD’s are common and also treatable. You are not alone. PMAD is an umbrella term that refers to the spectrum of emotional challenges that may arise during the perinatal period (from pregnancy through one year postpartum). There are seven different perinatal mood and anxiety disorders including Perinatal Anxiety, Perinatal Depression, Perinatal Panic Disorder, Perinatal Obsessive-Compulsive Disorder, Postpartum Posttraumatic Stress Disorder, Perinatal Bipolar Disorder, and Postpartum Psychosis. PMADs are the most common complication of pregnancy with 15-20% of people who have given birth reporting symptoms. While PMADS are most common in people who are pregnant or who have given birth, partners and adoptive parents can also develop symptoms of a PMAD. History of pregnancy- infertility, losses? How will I take care of myself? According to the research, between 15 and 20% of new moms will experience some sort of perinatal mood and anxiety disorder (PMADs) after giving birth. PMADs are the most common pregnancy complication. Having a baby can be very isolating and suffering from a mental health problem on top of that can cause even more problems. PMADs might affect a woman’s ability to care for herself and her children. These illnesses are common and treatable. Suicide accounts for 5.3% of perinatal deaths, or approximately 1 out of every 19 deaths in pregnant or postpartum women during that time period. Postpartum Mood and Anxiety Disorders; Healing Outcomes, by Laura Macone, MSW, LCSW, Doulas of Capitol Hill Client Portal, resource accessible for Doulas of Capitol Hill families (requires password). Climb Out of Darkness The world’s largest event raising awareness of maternal mental illnesses like postpartum depression, postpartum anxiety and OCD, postpartum post-traumatic stress, postpartum psychosis, perinatal bipolar mood disorders, and pregnancy depression and anxiety. Postpartum Progress The world’s most widely-read blog dedicated to maternal mental illness. Information on this web site is for educational purposes only. It may provide some self-help relief. However, it should not substitute for a comprehensive evaluation by a licensed mental health professional.